Old Pathology Building provides a rare glimpse into 19th-century medical technology. 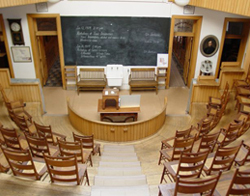 The building houses an original surgical amphitheater and laboratory rooms with original equipment. The facility illustrates 19th-century medical thought, which finally embraced scientific process. Visitors can explore the world of 19th-century medical history at this remarkably well-preserved facility. The Old Pathology Building is on the grounds of the former Indiana Central State Hospital, an asylum for the mentally ill. The State of Indiana bought the acreage in the 1850s. In the 1870s, all buildings were replaced and a massive Second Empire style hospital complex was built in the “Kirkbride” plan. Kirkbride buildings were roughly U-shaped, with successive wings stepping back to allow wards to be sealed off from one another. The state funded construction of the building in 1895, in the wake of breakthrough discoveries in medical and biological science. Through the use of deceased patients from Central State, the medical community could better understand disease and its effects. The information would then be disseminated nationally. State officials hired Adolph Scherrer as architect for the project. Scherrer had familiarity with state projects; he had taken over the Statehouse commission when his employer, architect Edwin May, died unexpectedly. Scherrer also drafted plans for other buildings at Central State during the 1890s. His functional Victorian Romanesque exterior for the Old Pathology Building combined dark brick walls with crisp dressed-stone lintels and beltcourses. The interior of the building has changed very little from its initial years of use. Equipment and furnishings remain intact. The surgical amphitheater is in place. Dissections performed here were intended to educate young interns studying at the nearby Indiana University School of Medicine. Central State fell into decline in the 1960s. The main Kirkbride style wards were demolished. In the 1990s, the state closed Central State Hospital. The Old Pathology Building is one of few reminders of the state’s activities on the site. Old Pathology Building is located at 3000 West Washington St., but the entrance is off of Vermont St.; follow the green marker signs around the fenced grounds to the museum lot entrance. Tours of the interior are available. Hours are 10:00am-4:00pm Thursday-Saturday for drop-in visitors. Wednesdays are by appointment only. Call 317-635-7329 for more information. INDYGO bus line from downtown: #8 Washington (westbound), disembark at Tibbs Ave.; walk north on Tibbs to north entrance off of Vermont St.